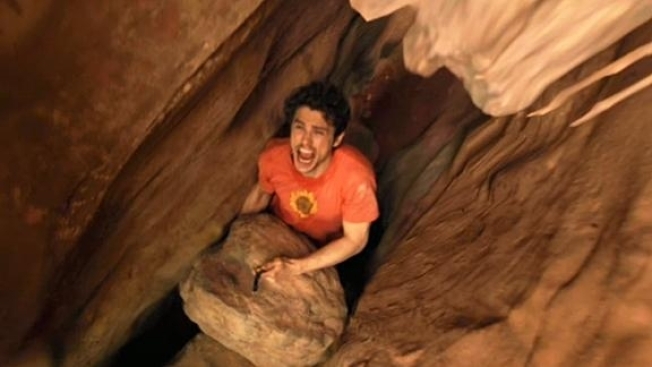 Here's About 90 Seconds of "127 Hours"
The first footage of "127 Hours," starring James Franco as the real-life God-among-Men who hacked off his own arm to escape being pinned by a boulder at the bottom of a canyon, has arrived. Gotta hand it to 'em, they've managed to put together a reasonably light, fun teaser for an impossibly grim story. Franco plays Aron Ralston, who in 2003 found himself with his right arm trapped under a large rock while hiking near Moab, Utah. Over the next 127 hours he videotaped a daily diary, began drinking his urine after running out of water, and carved himself a headstone in the canyon wall before deciding he had only one hope for survival. Director Danny Boyle has acknowledged that Ralston's story, while gripping, heroic and inspiring, is a tough sell, especially for film. "It's a lovely way of doing a new kind of filmmaking, really," Boyle told Empire in discussing the YouTube-like nature of the film. "We want it to be a challenge to you [the audience] to see if you can sit and watch it." Frankly, just writing the second graf of this piece was "challenging," actually watching Franco and Boyle recreate Ralston's story is daunting.